Bee's Knees works with several Facility Management Companies and Property Owners to repair and maintain their facilities up to the high standards that their customers deserve. When your property is due for a refresh, we can gladly handle the steps from planning, up to completion with final clean. Let us handle the hard work for you! 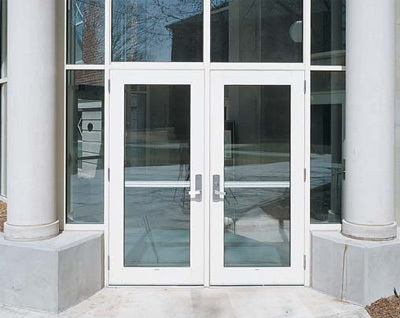 Let our commercial entrance and door experts get your doors opening and closing like new. We can even build new aluminum entrances to kick up the curb appeal a notch! Bee's Knees Craftsman Company has extensive knowledge in working with National Service Providers and Property Management Companies, to complete Work Orders correctly and on time. We can provide long term property maintenance as well as emergency repairs. Lots of properties go through inspections and are left with a list to repair for compliance. We have worked numerous times with the City of Madison on some of the inspections, to make sure our client successfully passes. If there is something outside of our abilities, we have a network of preferred contractors we work with, that we can make sure to get your property in compliance. Store Refresh/Remodels are necessary to keep your storefront looking appealing to your customers. We are able to handle the process from planning, to material procurement, to demo, then install, and final clean. Most of the time, we are able to work after hours to maintain use of your storefront during business hours. If you do not see something listed that you require, give us a call, and we most likely can take care of you!